September 30, 2008 started off the same as any routine muster on Suplejack Downs Station. The two helicopters got in the air at first light, piloted by Zebb Leslie and Andrew Scott (two of the Territories smartest cattleman of the air). I hung back to tidy up some loose ends at the homestead, and later met them on the job with my Gyro. After a few hours of mustering I landed at the stock camp yards, to help put up a hessian wing. When the helicopters returned to refuel my dad (Bill) and I decided it would be best if I go up with Zebb to point out some cut of points for the muster. It was approximately 10:20 AM when Zebb and I were flying back to drop me off to my Gyro when we experienced an engine failure. At an estimated 200 feet the helicopter I was a passenger in fell out of the sky. Zebb did an amazing job to guide the helicopter into the only clearing in the heavily timbered area. His options were limited and he only had one shot at a safe landing. Unfortunately the tail rotor struck a tree on our descent, slamming the machine upside down on the passenger side. Miraculously neither passenger nor pilot was thrown from their seat; in fact we both still had our seatbelts on. As a result of the fall, my head was forced hard against the roof dislocating my C4 vertebrae leaving me instantly paralysed with no sensation from my head down. I was completely conscious the whole time. My body was hanging from the seat belt and my breathing became laboured extremely quickly. 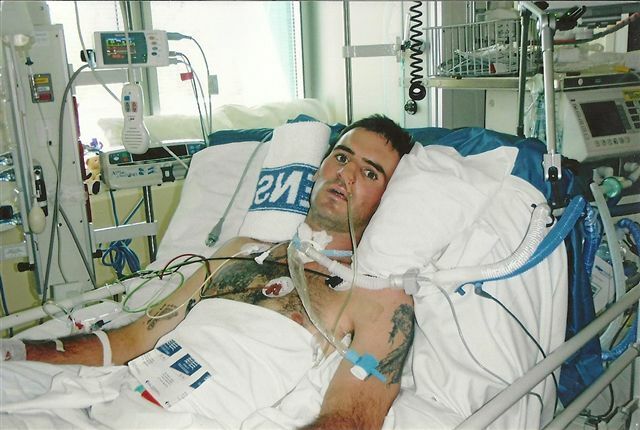 Both Zebb and myself knew not to move somebody with spinal injuries, but we had to push the rules aside as we were stranded in one of Australia's most harshest environments. Zebb let the seatbelt go and gently stretched my torso out giving me the ability to take short sharp breaths. It wasn't long before Scotty found us and the rescue mission started to unfold. The second helicopter, ferried my dad (Bill) and Brother in law (Shane) to the crash site. Meanwhile my mother (Letty), sisters (Lilly & Sonia) and my wife Sarah contacted the Royal Flying Doctors, a medic from a nearby goldmine and Helimuster to organise an R44 to retrieve me. My rescue became a race against the clock. The medic from the Granites goldmine undoubtedly saved my life. She brought the right tools to keep me afloat against the odds. For an incredible 7 hours I was able to pant enough oxygen to my brain to stay conscious. On sundown Mark Sullivan arrived with a full body stretcher and a flying doctor. I was airlifted back to the homestead where the Royal Flying Doctors aeroplane waited. After transferring me from the R 44to the aeroplane my wife Sarah and our youngest son Lawson accompanied me down to Adelaide Royal Hospital after a stopover at the Alice Springs Hospital. The immediate treatment of traction was unsuccessful so the doctors operated and manually manipulated my spine. They then stayed my vertebrae from the C2-C6 using bolts, screws and wire. 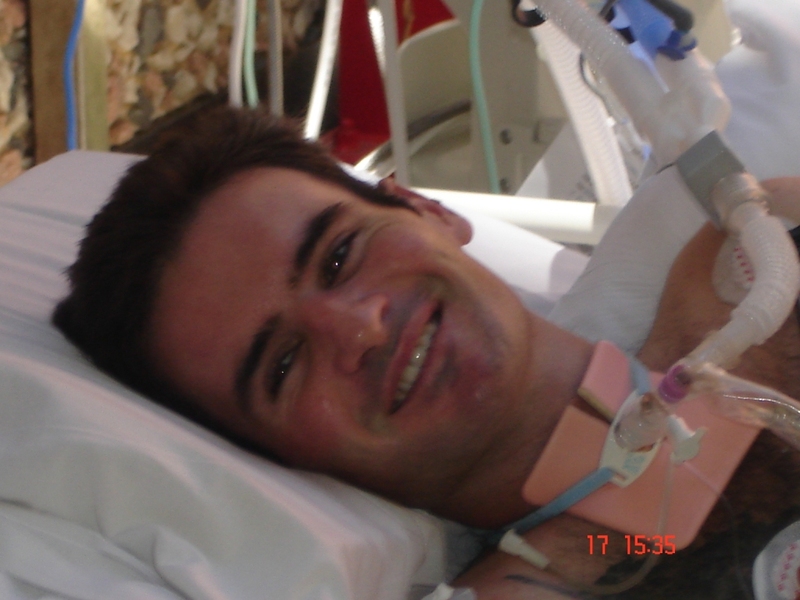 I was diagnosed a C4 tetraplegic. 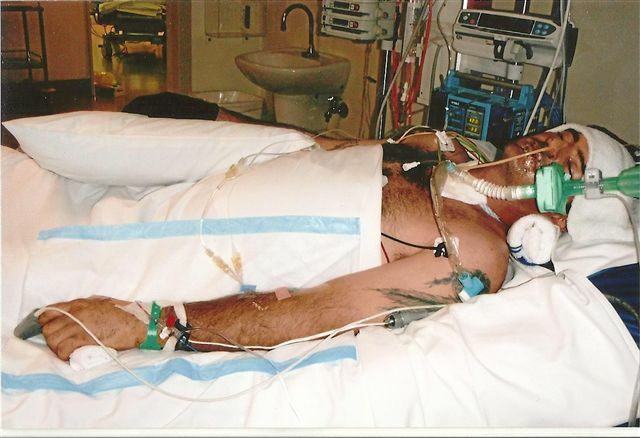 I spent 9 weeks in the ICU at the Royal Adelaide Hospital on life support. After 11 weeks I managed to wean myself off the ventilator. Just short of 3 months since the accident I was transferred to the spinal unit where I experienced my first shower (even if I was on a bed). I spent two weeks in the spinal until before I was moved to the Hampstead Rehabilitation Centre. I spent 7 months in rehab until I was finally well enough to return to Alice Springs. The support I was shown from family and friends was nothing short of a miracle. Not forgetting to mention my parents and my beautiful wife Sarah and sons Braxton and Lawson who endured every aching hour with me. "It doesn't matter the size of the mountain that faces you. Keep climbing!"